Himeko Sutori was designed from the beginning for you to make your own strategic role-playing game campaigns and even entirely new gameplay modes. Anyone who has ever made a mod for UDK or any Unreal Engine 3 game should be immediately familiar with the concepts presented here. Before you get started making your campaign for Himeko Sutori, please, please, please set up version control. We here at Rockwell Studios use Git, but there are many other options available. Setting up and using version control is beyond the scope of this document, but it’s not hard to get started, and there are plenty of resources out there to guide you. 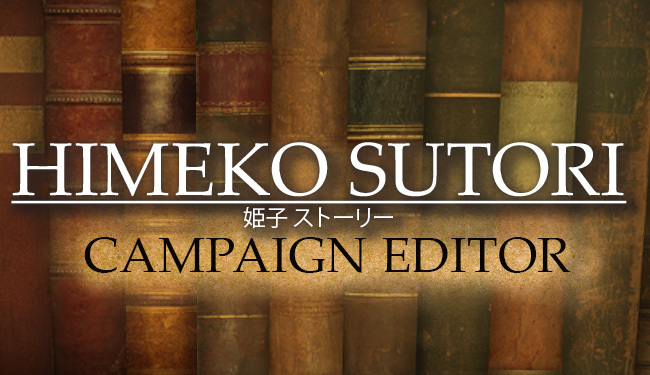 Although version control is not strictly necessary for you to start working on a Himeko Sutori campaign, it provides many important services and we strongly recommend using it. Perhaps the most important thing version control can do for you will be restoring previous versions of your work in case something goes wrong. You never know what might happen to your work, and the various tools and editors we discuss here might act in unexpected ways. So to reiterate, please use version control. You can start a free Git repository at GitHub so that if anything ever happens to your computer, your online repository will still be accessible. There. With that out of the way, let’s get started on making your Himeko Sutori campaign. Here, you have basically two options. Make a Himeko Sutori campaign. This is an adventure that uses all of the same game rules as found in the standard Himeko Sutori campaign. You can make your own buildings, cities, dungeons, landscapes, characters, enemies, and worlds, all without writing any additional code. That’s what we expect that most of you will want to do. Make a new gameplay mode for Himeko Sutori. In UDK terms, this is what is called a “total conversion.” The code and assets we provide are an ideal base for you to make your own retro action RPG, traditional small-party RPG, or even a monster-catching game. This is going to require some coding on your part. When you know what you want to make, go ahead and follow the instructions in those links. Or just follow the links to find out more about what each one entails.